Lound Infant School, Y1 Monkeys: Stranded! 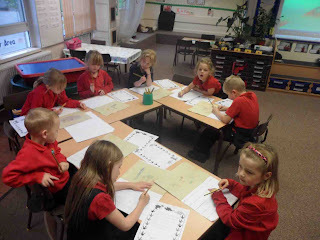 Then we created our own desert island maps by staining paper with coffee and drawing on features like volcanoes, rivers, beaches, jungles and camp sites. The next day we all went out in to the yard for some role play. The yard was our desert island and we dashed from one place to another. Mr Littlewood asked us what we could see, and we stretched those imagination muscles as we talked about pteradactyls swooping over the rumbling volcano, and the foul smell of the T-Rex's breath as he roared through the jungle. With all these thoughts fresh in our minds we went back in to the class room and began writing about our experiences on the desert island. 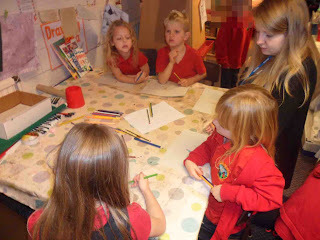 Rainforest sounds played in the background as we used all our ideas and 'wow' words to complete our writing. First I found a T-Rex. He was stamping and knocking down the triceratops. He was getting other dinosaurs. He ate one, all the blood came out of his neck it looked horrible. Next I saw brachiosaurus, it plucked the branches down on the floor then was dirt then made me cough. The T-Rex came again. There was branches on the floor I was terrified. The T-Rex ate the brachiosaurus then he went away. It was Ok now. I saw a pterodactyl. He swooped his tail. I nearly got hit with it. He swung his tail at me again, hit a coconut tree. I caught a coconut in my hands.